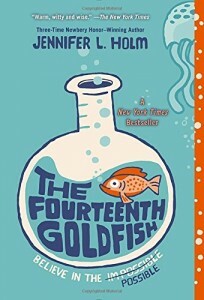 This rather unusual middle-school children’s book has a very quirky premise: Ellie’s grandfather has created a way to reverse his age and become a teenager again. However, that very odd premise becomes the pivot for a number of interesting themes, including breaking out of the mold that your parents have set for you, and the role of responsible science. The story itself felt rather unpredictable, and in some ways, seemed to be beside the point, as our attention stays with the inner life of Ellie, as she turns twelve and finds more of her own passion. Discovering she loves science is a very nice aspect in this children’s book, which allows us to see her own interest grow little by little. Her grandfather’s character is very well drawn, and would make a great character in a play, grouchy and smug. We forgive his gruffness because he helps Ellie find her own way, and in the end, she helps him find his way too. I think this children’s book has a place in a middle-school library, and could be an interesting way to talk about science. However, don’t expect it to be heavily science oriented, as it’s so full of character portraits, that the science part almost comes second.